This is another Extra Detail Magnification (or "EDM", for short) of the Eastern portion of the - litterally - ethereal (and extremely suggestive) scene, captured by the NASA - New Horizons Spacecraft, tells us yet another (actually, a new) story of Pluto's diversity of the Geological and Compositional Surface Features located on its the North Polar Regions. Long Canyons (not well visible here) run vertically across the Polar Area - such as part of the - so far - informally named Lowell Regio (after the Astronomer Percival Lowell, who founded the Lowell Observatory and initiated the search that led, in the end, to Pluto's discovery). The widest of the visible Canyons is about 45 miles (such as approx. 72,4203 Km) wide and runs close to the North Pole. Roughly parallel Subsidiary Canyons - visible in this scene - are approximately 6 miles (i.e. about 9,65604 Km) wide. The (highly) degraded Walls of these Canyons appear to be much older than the more sharply defined Canyon Systems which have been already found elsewhere on Pluto, perhaps because the Polar Canyons are older and made out of weaker Material. These Polar Canyons also appear to represent some kind of evidence (but we cannot be sure of such a circumstance) for an ancient (REALLY ancient!) period characterized by powerful Tectonic Activities. Furthermore, a (relatively) shallow and winding (---> sinuous) Valley runs through the entire length of the Canyon's Floor. Large, and irregularly-shaped Collapse Pits - about 45 miles (such as roughly 72,4203 Km) across and approx. 2,5 miles (i.e. roughly 4,02335 Km) deep -, "scarred" (in a way...) the entire Region. These Pits may indicate locations where the Sub-Surface Ice has (for unknown reasons) melted or sublimated from below, thus causing the Ground to fall on itself (---> collapse). The color and composition of this Region (shown here in Absolute Natural Colors) are also quite unusual. 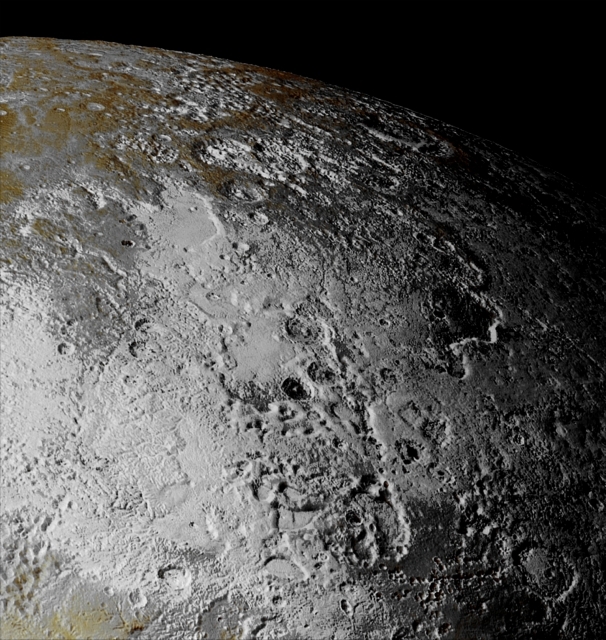 In fact, the Higher Elevations show themselves up in a distinctive yellow, so far not seen elsewhere on Pluto. The yellowish Terrain fades to a (relatively) uniform gray at Lower Elevations and Latitudes. The NASA - New Horizons Spacecraft's InfraRed measurements showed that Methane-rich Ice is abundant across the Lowell Regio while, on the other side, there are relatively little amounts of Nitrogen Ice. One possibility is that the yellowish Terrains may correspond to older Methane Deposits that have been more processed (---> affected/modified) by Solar (as well as Cosmic) Radiations than the gray Terrain. This Original Image was obtained by the NASA - New Horizons Spacecraft's Ralph/Multispectral Visible Imaging Camera (or "MVIC" for short). The picture's resolution is approximately 2230 feet (such as about 679,604 meters) per pixel. The lower edge of the Original Image measures about 750 miles (i.e. roughly 1207,004 Km) long. The picture was obtained at a range of approximately 21.100 miles (such as about 33.957,074 Km) from Pluto, about 45 minutes before the NASA - New Horizons Spacecraft's closest approach - which occurred, by the way, on July 14, 2015. The image (which is a crop obtained from an Original NASA - New Horizons Spacecraft's in enhanced colors and NON Map-Projected image published on the NASA - Planetary Photojournal with the ID n. 20473) has been additionally processed, extra-magnified in order to better see the details, contrast enhanced and sharpened, Gamma corrected and then re-colorized (according to an educated guess - or an informed speculation, if you wish - carried out by Dr Paolo C. Fienga-LXTT-IPF) in Absolute Natural Colors (such as the colors that a normal human eye would actually perceive if someone were onboard the NASA - New Horizons Spacecraft and then looked outside, toward the Dwarf-Planet Pluto), by using an original technique created - and, in time, dramatically improved - by the Lunar Explorer Italia Team.